An opportunity to be all in and be a YES for yourself and your community! Sign up for the membership BEFORE your Intro Rate expires and lock it in at $85/month for LIFE! All Class Cards Expire in 12 Months. WELCOME! We are so glad you are curious about yoga and you have chosen HEART & GRIT Power Yoga. When you arrive, please remove your shoes in the reception area and place your phone on do not disturb and/or airplane mode. Bring your yoga mat, a towel and water with you. No mat, no problem, we have them for rent, $2 each. Please arrive 10-15 minutes before class starts so we can show you around and get you setup in the system. We value your time and the time of each student and are committed to giving you the full hour to practice so we honor time integrity. Doors will be locked at the beginning of each class. There are a few parking spots next to our new building and a parking lot behind our building. If that lot is full, there is street parking on West Gate drive (one block from the studio) and you can walk through the church parking lot to get to us. You can also park on Saw Mill Drive (3 blocks from the studio). Do not park in the church parking lot, you may be towed and/or ticketed. I'm running late! Can I still come to class? If it is your first visit, we suggest you arrive 10 to 15 minutes before class starts. If you already have a class card or a membership and you have pre-registered for class, please arrive 5 to 10 minutes before class starts. For the benefit of those in class and for safety and security purposes, we lock the door at class time. This prevents us from allowing late arrivals into class. Out of respect for the students and the practice, we will not stop teaching to unlock the doors and let in late arrivals. Please do not knock on the glass windows. We encourage you to stay through the entire class. If you need to leave early, please do so prior to savasana (final resting pose) and inform the instructor ahead of time. You will also need to leave your belongings in the front reception area rather than the back storage area. Water and/or gatorade (or something similar) is the only beverage allowed in the studio. Goodness knows we all love our coffee and tea! We just ask that you enjoy them elsewhere! Can I bring my phone into the practice space? For your own benefit and for the benefit of those around you, we ask that you do not bring your phones into the studio space. Please silence your phones and leave them in the storage area. This is your time. Commit to being focused and present in the moment. To practice on your own, you must be 14 years or older and you must have a legal guardian sign your waiver before class. Ages 12-13 can take class if accompanied by an adult. For either, parental signature is required on the release form prior to taking class. Are any classes appropriate for beginners? Yes! All of our classes are designed for all levels. We create an environment in which each student can practice to their own level and ability. We introduce the basic asana (posture/pose) and offer modifications for beginners and more advanced practitioners. 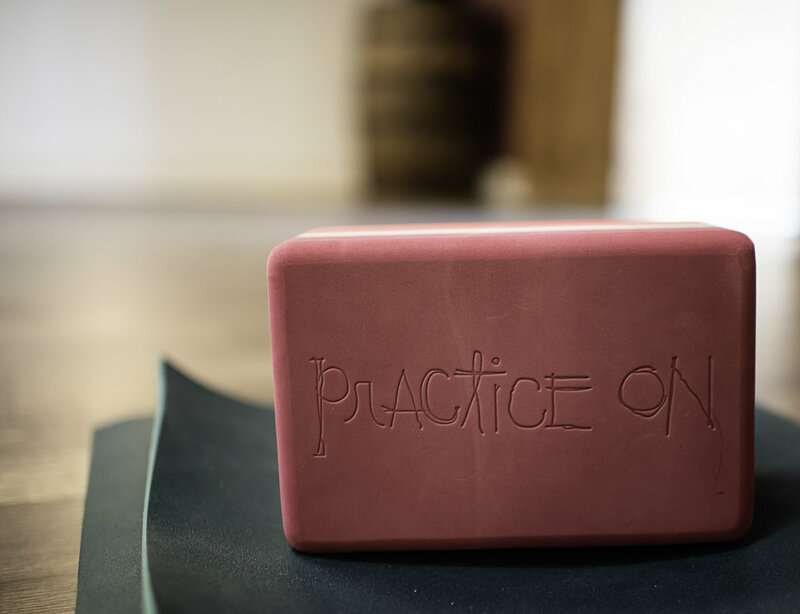 This practice is truly for everyone, especially you! If you want to see changes in both your mental and physical state, we suggest 2 to 3 practices per week. If you want to TRANSFORM, we suggest 4 to 5 practices per week. Why don't you play music? In general, we practice without music at HEART & GRIT Power Yoga. We strongly believe that in order to climb out of our heads and into our bodies, we have to be truly present in the here and now. We encourage you to listen to your breath, the teacher-leader and your body, which is difficult to do if you are singing along to a fun tune inside your head. I have an injury. Can I still practice? Yes, with your doctor's approval. Please let your instructor know that you have a specific injury and we can offer you several modifications. We also offer privates that specialize in showing you how to work with your injuries and stay in the practice. I'm pregnant. Can I still practice? Congratulations! In general, anything you do prior to pregnancy can be done during pregnancy. However, ALWAYS consult with your doctor. Poses can be modified throughout pregnancy to accommodate your changing body. Each term will bring different adjustments that need to be made, so please let your instructor know if you are pregnant. Often yoga teachers are the first to hear the good news!